A village cricket match that never finished due to the start of World War One is to be resumed this weekend. The original game between The Lee CC and Manor House in Buckinghamshire began on 3 August 1914, but was abandoned due to rain. After war was declared players vowed to continue after fighting ended, but many did not return home. The Lee CC chairman Matt Line said it would be a "fitting tribute" to the 30 people in the village who died. The 100-year-old match was brought to light after a member of the cricket club read about it in the Michael Senior book No Finer Courage, which documents life in the village during the Great War. "It was The Lee versus the Manor House and back in those days the house was the biggest employer and most of The Lee players were estate workers," said Mr Line. "No doubt there would have been a bit of an edge to the game. "In the war one [player] lost a leg and was severely injured. The Lee's fast bowler was killed by a sniper. But another chap - GD Roberts - did survive and went on to play rugby for England. "We all sat around and thought, 'We just have to do this'. I think it will be a fitting tribute." 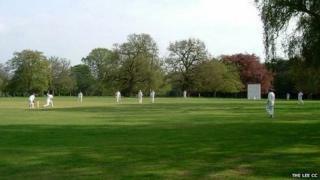 The game between The Lee and a select XI representing the village's Manor House will take place on Sunday.